Physical hazards (noise and vibration) are generally present in the working environment, a large number of workers from the European Union suffering from problems caused by workplace exposure to high levels of noise or vibration. The issue concerning exposure of workers to physical hazards also affects employers from the economic point of view, generating a significant decrease in working capacity. Low efficiency caused by exhaustion and overworking, mistakes performed in various operations caused by distractions are generated by exposure to noise and/or vibration noxae. Starting from theory to practice, the paper objectively highlights, using noise and vibration measurements, the comparison of results obtained with threshold values specified by in force legislation and their implications for the health of workers. The paper also analyses the ways in which noise and vibrations generated by technological processes influence workers activity, in order to estimate the level of exposure to occupational risk factors present during usual work hours and the identification of main diseases caused by them. Industrial development has led to increased work power and speed for equipment used in production, thus bringing a contribution to diversification and increased number of physical noxae sources and implicitly to increased number of exposed persons. Noise and vibration are the most important industrial noxae that pose hazards to workers’ health representing harmful factors arising from the deterioration and/or malfunction of work equipment . Occupational risk refers to the likelihood of worker’s injury or illness as a result of exposure to workplace hazards. Occupational risk assessment aims at ensuring worker safety, contributing to enhancement of prevention and protection measures quality . Objective assessment of specific risks and quantification of level of noxae specific to each activity carried out by industry workers leads to an increase in occupational health and safety. Improving working conditions in industry by applying the latest occupational health and safety technologies contributes to increasing the business’s economic benefits (reducing the number of accidents and illnesses, namely payment of damages and medical care) as well society’s benefits, as a whole. Occupational accidents and illnesses can cause serious financial losses for a business but also for society by occurrence of occupational illnesses that require the allocation of funds for their treatment and healing. By harmonizing national legislation with European legislation, respectively by adopting health and safety at work directives and recommendations, the employer is solely responsible for the health and safety of workers. As the steps to be taken to ensure minimum health and safety at work conditions imposed by in force regulations, besides an organizational effort also require a sustained financial effort, knowledge of noxae levels respectively professional risk, leads to cost effectiveness of prevention measures taken to achieve a high level of security. The purpose of reducing exposure to physical noxae is to achieve optimal workplace comfort at a convenient price. Exposure to physical noxae favours a decrease in working capacity through the emergence of a state of tension, a decrease in concentrating attention, in coordination of professional technical movements, in the ability to assess certain situations as a result of occupational stress. Voice masking effect, respectively masking of various sound and verbal signals during work processes leads to special, exhausting efforts concerning attention, lowering work efficiency. Within the research activities carried out by INCD INSEMEX Petrosani, a number of noxae measurements were carried out at the workplaces of economic traders with activity in the steel and extractive industries in accordance with the national legislation in force. In order to quantify the level of workers exposure, measurements of noise (according to GD no. 493/2006) and vibrations (according to the GD no. 1876/2005) levels were carried out in several workplaces considered typical, for establishing the technical and organizational measures to be taken (according to Law 319/2006). Bruel & Kjaer type 2250 integrative sonometers, Bruel & Kjaer type 4231 calibrators and the BZ 5503 software for viewing measurements were used for noise measurements. To ensure the quality of results, the sonometers and calibrators operating standards are checked in accordance to requirements of legislation in force. Acoustic pressure measurement to determine the A-weighted sound exposure level and/or equivalent continuous A-weighted sound pressure levels was carried out with the microphone placed in the position(s) usually occupied by the worker’s head. Measurement of vibration levels was performed by using a 4447 type vibration analyzer, type 4515-B-002 and type 4520-002 triaxial accelerometers, Bruker-Kjaer type 4294 calibrator, in accordance with in force legislation. Measurement of vibrations transmitted through the hand-arm system was performed for devices that had to be held with both hands, for each hand. The exposure reported was the highest value of the two. Assessment of the hand-arm vibration exposure level is based on the calculation of the daily exposure value for an 8-h reference period A (8), expressed as the mean square root (msr) (absolute value) of weighted acceleration frequency values, measured on the orthogonal axes a(hwx), a(hwy), a(hwz) . Table 13.1 presents results of measurements performed at the main noise and vibration generating equipment used in the steel and extractive industries. 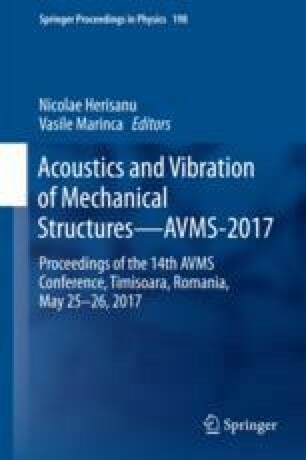 variation in time and space of noise and/or vibration source. In accordance with HG 493/2006 on workers exposure to risks of noise pollution, exceeding of exposure levels have been noted, in the range of 3–28 dB (A). As shown in Table 13.1, the most noisy workplaces are also associated with high vibration levels, for example the electric-arc furnace platform (steel industry) and the perforation by using PR90 hammer drill (extractive industry). Use of personal hearing protection. After measuring and quantifying vibration and noise levels to which workers are exposed, measures may be applied to reduce occupational exposure to these noxae. provision of hearing protection equipment and clothing to protect exposed workers against cold and moisture (factors that aggravate the symptoms of vibration-related illnesses). Noise not only has a pathological action upon the auditory organ, causing temporary or permanent loss of hearing, but also has other harmful effects on the body in general. Exposure to high noise levels produces certain disorders such as increased heart rate, breathing rate, changes in blood pressure. Exposure to noise causes changes in the body’s physiological balance. The general symptom is a feeling of tiredness, weakness; sometimes not even sleep or a few days of rest does not allow for a full recovery. Disorders can go as far as dizziness, syncope, permanent migraine and headaches, loss of appetite, profound weakness, and anemia. Knowledge of the real harmful effect of noise exposure is limited by the fact that the investigation of short periods of exposure doesn’t describe the real effects on the worker. Studying the long-term effects of noise on workers affected by noise exposure is hindered by the fact that most workers that start having auditory problems did not perform audiograms showing the route of exposure to noise . Noises produced in the technological processes have numerous consequences on the human body, affecting the working and response capacity . Depending on noise level, there are several categories of harmful effects on humans, namely: the masking effect, auditory fatigue, acoustic trauma, acute hearing loss; occupational deafness. Vibrations that act upon the human body produce discomforts to physical and intellectual activity as a result of fatigue, mechanical deterioration of some body elements and subjective phenomena. The harmfulness of vibrations depends on their characteristics and conditions of transmission to the human body, depending on contact area with the vibrating object and exposure time. Most common lesions occur in bones, hand, shoulders and elbows joints. Mechanical damage may occur if accelerations are high enough and manifest by bone damage, lung damage, intestinal wall injuries, skull lesions, cardiac damage, peripheral vascular reactions (Raynaud’s disease). Environmental factors also cause worsening of vibration diseases symptomatology, most important etiological favouring factors being high humidity and low temperature. The first signs of hand-arm vibration exposure are numbness and pain in upper limb phalanges, a disease called Raynaud’s syndrome (white fingers disease) that translates into neurological and mental disparate or general syndromes, such as progressive muscle atrophies. The purpose of reducing the effects of workers exposure to noise and vibration noxae is to increase safety and health at work. In order to achieve this goal, employers have at their disposal a wide range of applicable measures and normative acts that can improve working conditions, measures materialising into increased work capacity and improvement of workers health. Risk assessment is a dynamic process (through refurbishment or reorganization of the technological process) allowing businesses and organizations to implement a proactive risk management policy at work. For these reasons, it is important for businesses where the risk of exposure to noise and vibration is present, to carry out regular assessments of workplaces. The case study presented showed that in workplaces where there are high exceeding for noise noxae, exceeding of the maximum admissible vibration limits are also present, implying the need for identification and application of some technical—organizational measures that are effective for diminishing both noxae, in order to reduce workers exposure to both pollutants. Bringing forward some general technical and organizational measures to meet the employer needs is not enough; these measures need to be customized according to equipment, workplace, assessed risks, etc. ; although exposure levels in extractive industry are similar in value to those in the steel industry, the sources of noise are different implying the need for noise reduction measures specific to each activity. Because of specific nature of the activities carried out in steel and extractive industries, all injurious conditions (noise, vibrations) for the worker can not be completely eliminated. The effects of these noxae can be reduced by using personal protective equipment, reducing exposure time, refurbishing, etc., to prevent occupational diseases that occur over time.